The classic simplicity of roller shades has led to their statues as a perennial favorite among window coverings. We have updated the classic simplicity of these quality custom shades with new fashion fabrics, streamlined mechanism and specialized sun control products. Take another look at the traditional roller shade and discover an American classic redefined. Roller shades really do offer something for everyone! This collection provides room darkening option for anytime - morning, noon & night. Ideal for me.. Basket weave (3%) roller shades are made of vinyl-coated fiberglass yarns and are designed expressly.. 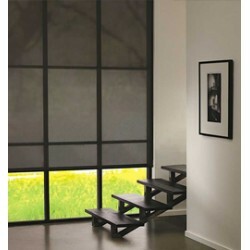 These Solar roller shades (M Screen) with 5% openness are a popular window treatment to block sun ra..